From bandits and cattle-rustlers to smugglers and illegal whiskey production, our Perthshire town has had a rather colourful past, and it is no surprise it used to be likened to a Wild West town. These days, things are a lot more orderly in Crieff, but it is still a very exciting place to be and a great place for hosting events. If you are planning to have your wedding reception, a corporate event, private party or large public gathering in Crieff and you are looking for some exciting food that isn’t going to break the bank, look no further than Hog Roast Crieff. We have the experience and expertise to make your day extra special and give you a dining experience to remember regardless of your requirements, your venue or your number of guests. Crieff is of course in the heart of whiskey country and is now best now for its Famous Grouse Experience at Glenturret Distillery, which was officially established in 1775. Here at Hog Roast Crieff, we are also staunch advocates of local produce , which is why we only ever source our ingredients from the very best local suppliers and we are incredibly discerning about the original of every single item on our extensive range of menus. 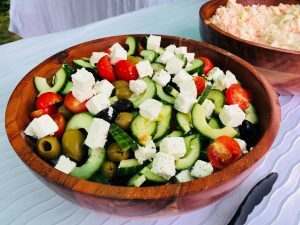 If you choose us to cater for your big day, you won’t find a single ingredient that is below-par or any dishes that have been pre-made elsewhere. Everything is fresh and made from scratch by our expert team at your venue, whether we are cooking for 20 people or 200. We invest the same level of care and professionalism into every event we cater for and we never cut corners when it comes to the quality of our food and service. We have the same exacting standards as the distillers at Glenturret and take just as much pride in what we produce. From sophisticated soirees to belly-busting buffets for the local Highland Games, Hog Roast Crieff can offer you the full spectrum of event catering and adapt our style of service seamlessly to suit the nature and size of your event. We know when it comes to your special day, only the best will do, and our team will always go the extra mile to provide it.